Were Hedge Funds Right About Buying Anheuser-Busch InBev SA/NV (BUD)? Is Anheuser-Busch InBev SA/NV (NYSE:BUD) a good bet right now? We like to analyze hedge fund sentiment before doing days of in-depth research. We do so because hedge funds and other elite investors have numerous Ivy League graduates, expert network advisers, and supply chain tipsters working or consulting for them. There is not a shortage of news stories covering failed hedge fund investments and it is a fact that hedge funds’ picks don’t beat the market 100% of the time, but their consensus picks have historically done very well and have outperformed the market after adjusting for risk. Anheuser-Busch InBev SA/NV (NYSE:BUD) was in 21 hedge funds’ portfolios at the end of December. BUD has experienced an increase in hedge fund sentiment of late. There were 20 hedge funds in our database with BUD holdings at the end of the previous quarter. Our calculations also showed that BUD isn’t among the 30 most popular stocks among hedge funds. We’re going to go over the key hedge fund action regarding Anheuser-Busch InBev SA/NV (NYSE:BUD). How are hedge funds trading Anheuser-Busch InBev SA/NV (NYSE:BUD)? Heading into the first quarter of 2019, a total of 21 of the hedge funds tracked by Insider Monkey held long positions in this stock, a change of 5% from the second quarter of 2018. 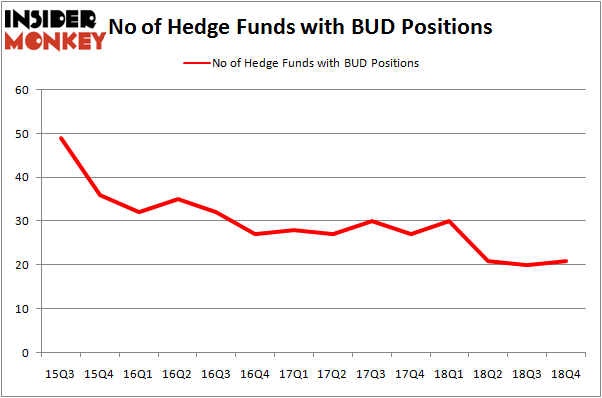 The graph below displays the number of hedge funds with bullish position in BUD over the last 14 quarters. With the smart money’s positions undergoing their usual ebb and flow, there exists a few noteworthy hedge fund managers who were upping their stakes considerably (or already accumulated large positions). Among these funds, Gardner Russo & Gardner held the most valuable stake in Anheuser-Busch InBev SA/NV (NYSE:BUD), which was worth $514.5 million at the end of the third quarter. On the second spot was Fisher Asset Management which amassed $416.1 million worth of shares. Moreover, Alkeon Capital Management, Maverick Capital, and Renaissance Technologies were also bullish on Anheuser-Busch InBev SA/NV (NYSE:BUD), allocating a large percentage of their portfolios to this stock. As aggregate interest increased, specific money managers have jumped into Anheuser-Busch InBev SA/NV (NYSE:BUD) headfirst. Alkeon Capital Management, managed by Panayotis Takis Sparaggis, assembled the most valuable call position in Anheuser-Busch InBev SA/NV (NYSE:BUD). Alkeon Capital Management had $98.7 million invested in the company at the end of the quarter. Ryan Caldwell’s Chiron Investment Management also initiated a $21 million position during the quarter. The other funds with new positions in the stock are George Soros’s Soros Fund Management, Leon Shaulov’s Maplelane Capital, and John Overdeck and David Siegel’s Two Sigma Advisors. Let’s check out hedge fund activity in other stocks similar to Anheuser-Busch InBev SA/NV (NYSE:BUD). We will take a look at BP plc (NYSE:BP), Citigroup Inc. (NYSE:C), Abbott Laboratories (NYSE:ABT), and Amgen, Inc. (NASDAQ:AMGN). This group of stocks’ market caps resemble BUD’s market cap. As you can see these stocks had an average of 55.25 hedge funds with bullish positions and the average amount invested in these stocks was $3700 million. That figure was $1133 million in BUD’s case. Citigroup Inc. (NYSE:C) is the most popular stock in this table. On the other hand BP plc (NYSE:BP) is the least popular one with only 34 bullish hedge fund positions. Compared to these stocks Anheuser-Busch InBev SA/NV (NYSE:BUD) is even less popular than BP but hedge fund sentiment started to increase last quarter. Our calculations showed that top 15 most popular stocks among hedge funds returned 19.7% through March 15th and outperformed the S&P 500 ETF (SPY) by 6.6 percentage points. 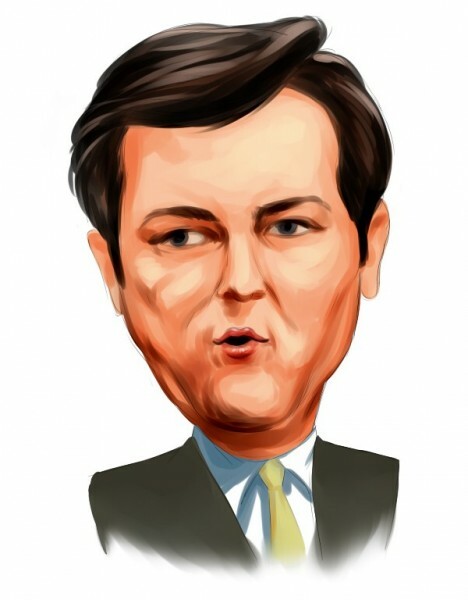 Hedge funds were also right about betting on BUD as the stock returned 23.5% and outperformed the market as well. Do Hedge Funds Love Taiwan Semiconductor Mfg. Co. Ltd. (TSM)? Here is What Hedge Funds Think About Cisco Systems, Inc. (CSCO) Were Hedge Funds Right About Merck & Co., Inc. (MRK)? Were Hedge Funds Right About The Coca-Cola Company (KO)? Were Hedge Funds Right About Novartis AG (NVS)? Should You Buy The Boeing Company (BA)?